REVIEW - Flame Over - Use a Potion! 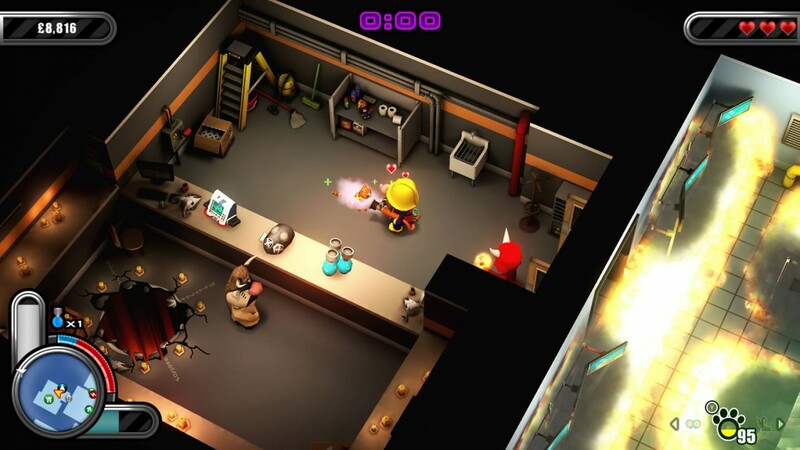 Flame Over puts you in the role of pro fire fighter Blaze as he works through sixteen randomly generated floors of a building, putting out fires and saving lives along the way. There’s no need for an in-depth story here; whilst there are humorous quips aplenty, Flame Over is all about the hard as nails rogue-like gameplay. 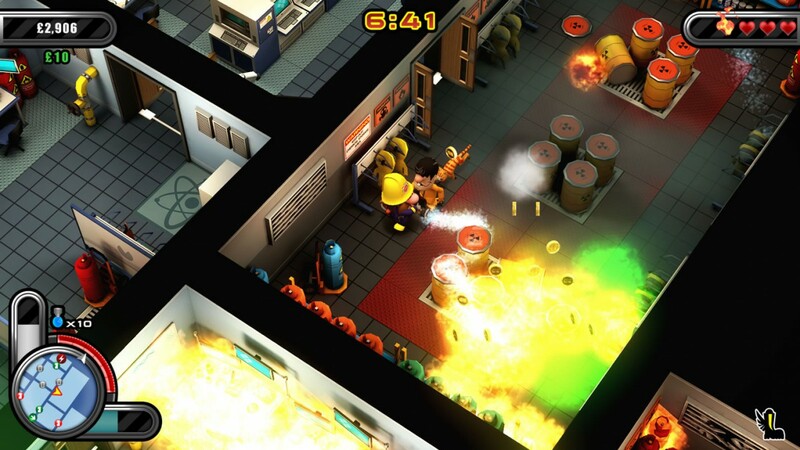 The controls are akin to a twin stick shooter; one stick controls Blaze whilst the other controls the direction of your fire-fighting apparatus. You’re armed with both a hose and an extinguisher, each effective at doing different jobs. With different types of fires to take care off you’ll need to utilise both tools perfectly – you won’t want to tackle electrical fires with your hose, but it does a great job of stopping fires from spreading. The game controls really well with the twin stick approach making the extinguishing of hazardous flames feel wholly satisfying. It takes concentration to make sure the flames are completely extinguished though; I was fooled on a few occasions only to find a fire spark back into life. The fires themselves fight back in their own little ways; you’ll have balls of fire spitting your way, requiring careful movement if you’re going to survive. Extinguishing all fires in a floor equals success and sees you moving up to the next flame filled floor. Each of the sixteen floors is randomly generated, meaning you never quite know what’s coming next. The layout of a room isn’t revealed until you walk into it; you have to be prepared for anything. Whilst there isn’t a ton of variety in level structure, there are four different styles of environment to work through so at least the appearances change a little. 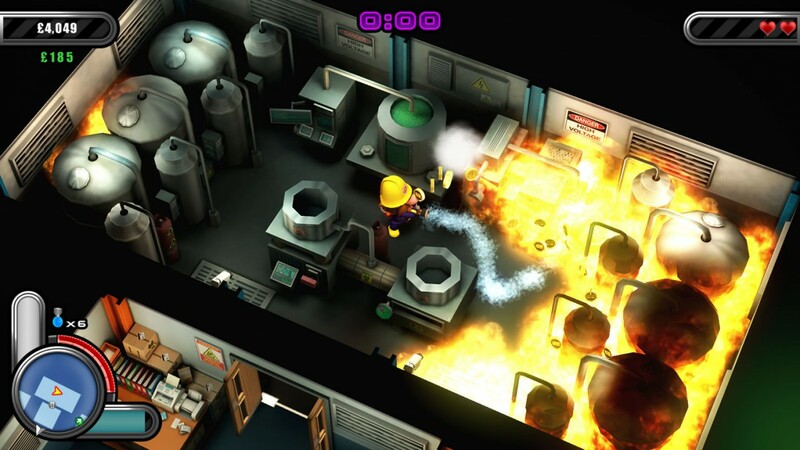 Of course, the game isn’t as simple as extinguishing fires. The game also has you working against both a clock and a health meter. If you’re health runs out it’s sayonara for you; equally frightening, the timer running out results in Death himself chasing you down. He’s avoidable, but with the perils of spitting flames working against you too you might find yourself succumbing to him on a few occasions. You’ll find that both your time and health will drop quickly in the game; fortunately there are ways to recover them. Rescuing people in peril will add time to your meter and, almost stereotypically of firemen, rescuing cats will restore your health. It’s a little quirky, but charming nonetheless – it all adds to the not-so-serious approach that the game takes. Players be warned though; despite its charm and simple premise, Flame Over is a punishing game. High difficulty is a common trait among rogue-like games and Flame Over is no exception. Whilst a high difficulty level is often seen as a feature, I feel that at times the game doesn’t do itself any favours; despite completing the tutorial, when I headed into the main game I found myself slightly out of my depth. It took hours of play (and constant failure) before I started to get to grips with the game, but even then I’d still find myself constantly meeting a burning, grizzly end. Of course, this could just be down to my lacking skills; similar complaints on the internet lead me to think otherwise though. Whilst I’m a fan of gruelling difficult in games, the learning curve in Flame Over was a little off putting at times. The further you progress though, the easier the game becomes. You eventually unlock power-ups that will carry through to your next playthrough, with your character’s incremental improvements helping you further progress a little further on each playthrough. There’s still no room for complacency though. Graphically, Flame Over does the job with pretty, albeit simple, graphics. 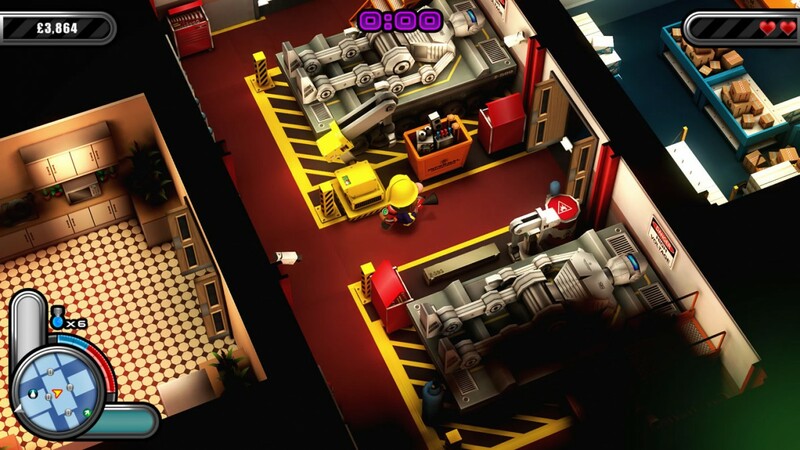 Everything takes place from an isometric point of view so you can appreciate the details in each level. Characters have a cute look to them – it’s almost enough to fool you into thinking this could be a kids game. Importantly, fire looks great too; it spreads throughout each room and the bright, burning embers make the fire seem almost alive. I feel that Flame Over has a big elephant in the room – the high difficulty. It’ll put a ton of people off the game; it had me utterly frustrated and simply rage quitting on plenty of occasions. Some people like a challenge, but Flame Over really throws you in the deep end; so much so that it loses that ‘one more go’ appeal that most rogue-like experiences offer. Of course, the more you play the better you’ll become and then you can start enjoying Flame Over for what it really is; an attractive, enjoyable experience. It’s oozing with charm and clever mechanics that, although challenging, are wholly satisfying when you get to grips with. The question is though, are people willing to commit the time to overcome the ridiculously steep learning curve and start enjoying the solid expereince that the game has to offer?